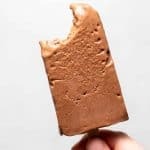 Vegan Chocolate Banana Popsicles that taste just like a fudgesicle! A kid-friendly dessert you can feel GOOD about! Dairy-free and only 5 ingredients! Place all ingredients in a blender and puree until very smooth and creamy. Taste and adjust sweetness as needed. Pour the batter into 8-10 popsicle molds (will vary depending type of mold used) and freeze for at least 6 hours, until solid. Enjoy! Store in a sealed container in the freezer until ready to serve.